His link to the village of Nelson is that he is recorded in the Parish War Memorial register at St Mabon's Parish Church, Llanfabon. I am informed that one of the likely reason for this was a regular attendance at St John’s or St Mabon’s Churches, Nelson. I was initially unable to find a great deal of information about James Northey. I found that his father was called John and was born in about 1837, making him 44 years old when James was born in 1881. James was actually born in Gelli, Ystrad Rhondda which is in the parish of Ystradyfodwg. James had a sister called Elizabeth Ann who was born in 1872. At this time James and his father John were shown as living with Robert and Elizabeth and their family. In August 2011, I received an E-mail from Karen Krich who lives in Pennsylvania, U.S.A. and stated she was a distant cousin of James. She provided me information about an American web-site that held newspaper articles from years gone by, and included information about the Northey family. I researched that web-site and found that some of my initial research findings could now be confirmed. James indeed was born in Gelli, Rhondda, South Wales. His parents were John Northey who was born in Chasewater, Cornwall in 1835 and Elizabeth Morgan, who was born in Merthyr Tydfil in 1843. Frederick - born in 1885. At the time of the war, the main family home was at 8 Thomas Street, Pentre, Rhondda, but what of James’ brothers and sisters. James’ brother Thomas John had moved to the United States, married a lady who had several sons from her previous marriage. Thomas considered these to be his sons as he refers to having six sons who were carrying out out war service during the First World War, one being in the British Navy, one in the U.S. Navy, three serving with the British Army and the sixth was serving with the Canadian Forces. Thomas John Northey made his family home in Mohrland, Utah, U.S.A.
His brothers John and Frederick were workers in the munitions factories in the West Bromwich area of Birmingham. James’ brother William enlisted himself and was a private in the army, though being 45 yrs old at the outbreak of war, I doubt if he saw much active service. In the latter part of 1889, William married a Sarah Rees and they had their own family. Sarah Jane married an Edward John in Pontypridd in 1898. During the First World War, she played her part in the effort, being a nurse in a hospital in London. Records show that her husband Edward died in 1936. James himself married Beatrice Jane Allen in July 1915 in Pontypridd, Glamorgan. I cannot find any record of them having any children. Beatrice was born to a John Allen, who was a coal miner. 1911 census report shows that John Allen was living at 9 Bontnewydd Terrace, Trelewis. There is no ‘wife’ shown on the record, but there are three daughters shown. A 1915 newspaper article shows John to be living at 12, Caiach Terrace, Nelson (as the paper printed). Catherine was born in 1896. James Northey, D.C.M. was buried at Beechgrove Cemetery, Edwardsville, Treharris and his grave is shown to the left. 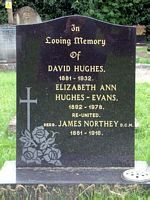 He is buried with David Hughes and Elizabeth Ann Hughes-Evans. Elizabeth is the sister of James’ wife, Beatrice. Following James’ death in 1916, Beatrice re-married in 1922 to a David Aston. The marriage took place at Pontypridd, but they made their home in the Swansea area of South Wales. The actual citation reads “ For conspicuous gallantry when he went out four times over the front parapet under heavy rifle fire at about 150 yards range and successfully brought in four wounded men”. The citation is dated 11th March 1916. 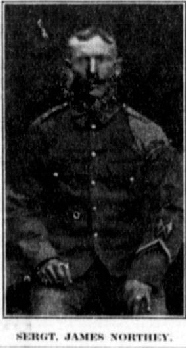 Another article printed in the Sun newspaper was ‘Verses to the memory of James Northey’, written by his brother Thomas John Northey. Through news across the sea. His loved ones, you and me. For James we loved so dear. And meet, to part no more. No troubles, war or strife.